The Daimon Brunton Quintet returns to their spiritual home .. The Paris Cat Jazz Club! DBQ (Daimon Brunton Quintet) have been playing at the Paris Cat since 2007 .. the year the now famed jazz club opened. 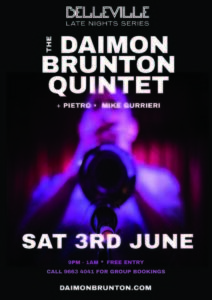 Since establishing in 1996 ‘The Daimon Brunton Quintet’ has recorded 4 albums; sold out venues all over Australia and completed a national tour. Influenced largely by Clifford Brown, Freddie Hubbard, Hiromi, Snarky Puppy and Wynton Marsalis, The Daimon Brunton Quintet is like nothing you have ever heard before. 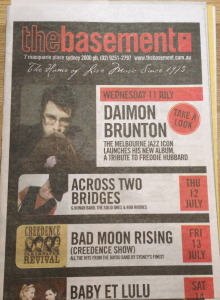 On Wednesday 13th June, Daimon Brunton and his outstanding band enter the basement The Paris Cat Jazz Club for an evening of unparalleled inventiveness. This is the new direction of jazz and you won’t be able to take your ears off it. This outrageously stellar line-up mesmerises and captivates like no other. Don’t miss this special event at The Paris Cat Jazz Club – Wednesday 13th June. The DBQ National Tour started today 6 years ago! After this I sat down and thought .. what next?? 3 months later Soul Cupcake was born! What a ride it’s been so far!! Pack your tinsel for the funkiest sleigh ride of your life! SANTA VISITS SOUL CUPCAKE AT BIRD’S BASEMENT! This is an extended version of the sensational 10-piece Soul Cupcake soaring through one of their originals ‘You And Me’. This is what we believe pop music should sound like! Funky, Fun, Sophisticated, Intricate, Catchy, Powerful and Happy. Fronted by the amazing Adelaide Clark and composed, arranged and lead by Daimon Brunton this is an absolute keeper! amazing Adelaide Clark and composed, arranged and lead by Daimon Brunton this is an absolute keeper! DBQ plays Belleville in a one-off ‘not to be missed’ show! Due to the members been extremely busy on other projects The Daimon Brunton Quintet (DBQ) only plays a hand-full of gigs a year and in the last few months I’ve been inundated with requests as to when the band will be playing live again. Well THIS IS IT! A late night, no holes barred extravaganza at Belleville. This will be a truly wonderful live show! And it’s FREE ENTRY!